Soccer is a great sport that has spread all over the world. 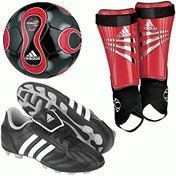 One of the reasons for its success is that it requires no special soccer equipment if you think about it. All you need it something to kick around and a decent amount of space to do it in. However, if you are serious about playing soccer it doesn’t hurt to get some equipment that will enhance your performance and keep you safe. A good quality soccer ball will last you ages. Not only that, it is also easier to control and will enable you to develop better ball control skills. Cleats are perhaps the most important part of the game. These spiked shoes will ensure that you don’t slip and fall. This is important because soccer requires you to be nimble and balanced on your feet at all times. Shin guards are very useful especially when you are playing seriously. Opt for a lighter guard if you are an offensive player and a tougher guard if you are playing defence. For goalkeepers, Gloves will protect you from injuries and also improve your grip when catching the ball. Soccer uniforms are great to have, but aren’t necessary unless you form a team. Normally you can do with shorts that allow you a great amount of movement and a cotton jersey. Lastly, soccer bags can be used to cart all of this equipment and a change of clothes around. As you can see, you don’t really need all of this if you are just playing for fun. But if you are serious about the sport, it might be well worth investing in.